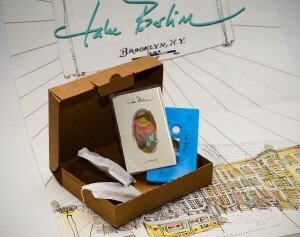 Take Berlin is a Soul/Folk band based in Brooklyn, and they make some of the most honest music around. The problem is that it’s quite a feat to break in a new group that writes songs that require attentive listening. To help them along I volunteered to create a promo tool which would serve as a simple introduction to their world. What I came up with is a book sized package that includes: a slow living/listening manifesto, an EP on a cassette, a poster, stickers, a download code, and some tasty tea. The package is designed in a way that the contents reveal themselves in layers, and to know what s inside you have to take everything out a piece at the time, until you reach the tape and the tea. The instructions inside ask the person opening the package to turn off their phone and computer, brew the tea, and actually take the time to listen to the music. The cassette layout was designed by 44flavours. The poster, the sticker, and the instruction booklet by Cecilie Blank. The tea was selected and hand packed by the beautiful people of Take Berlin. The photo below was taken by Juan Rendon and was featured in an interview with Take Berlin published by Colectivo Futuro. You have to click on the picture to see it in a legible size, and for it to come into focus.